It's fun to have fun but you have to know how. 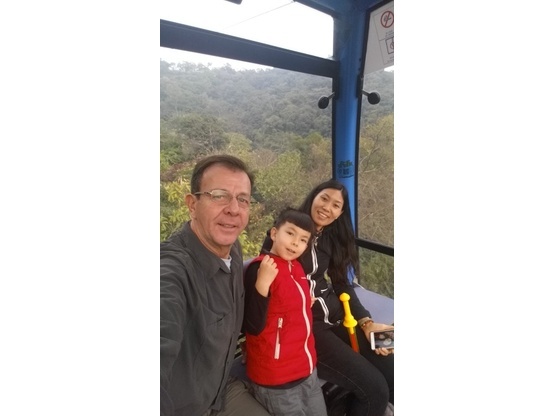 The three of us in an aerial tram in China. 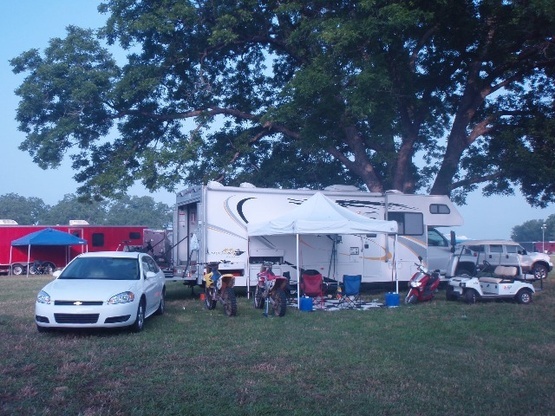 Typical use for our larger toyhauler with 4 motorcycles, 1 scooter and 1 golf cart stored in the garage area, then set up at some motocross event or other gathering for several days. It has composting toilet and recirculating shower so no black water and the grey water is recycled to drinking water quality (though we don't drink it) Can boondock for several weeks with just the water on board. The little beast, and the bigger thug 26' and 36' toyhaulers The big one can carry up to 8 dirtbikes, and the little one up to 5. The new Wind Beater, and the older Wind Cheater... Big one 8 mpg the little one is fast and gets 14-15 mpg. The little one is also a Hybrid it burns gasoline and rubber! Pulled the 1978 Oldsmobile 403 out and replaced it with a new fuel injected, twin turbo charged, GMC 8100, Air suspension all around, disc brakes, new heavier gauge frame, best marine appliances, it has 1/3 of a Tesla motors battery pack to run AC and everything for 2 days on recharge (then recharges from coach engine driven generator in 1.5 hours, far too many upgrades and modifications to list all including a recirculating/filtering shower system that uses only about 1 pint of water for a 15 minute shower. I'm a retired engineer, and 75% full time RV dweller, I have a workshop with apartment and 3 RV hookups in Pleasanton, TX, My wife AiXia is Chinese and our son Gaston turns 9 in Sept 2019. Design Engineer/Project Manager, I have a fully stocked workshop that if I'm there people are welcome to use. 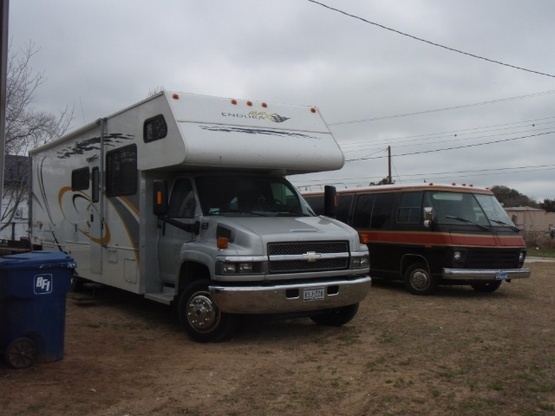 Additionally I can perform any repairs or modifications you may want in your RV. Just some of those teeny-tiny ants that come to visit from time to time. And we have a big bird feeder in the yard. We boondock almost everywhere we go, mostly at motocross race events and festivals, though we do stay in some campsites for beach access or some-other reason. I have both the 26' GMC Class A Toyhauler, and a 36' Class C Toyhauler, we sometimes pull a trailer or towd. 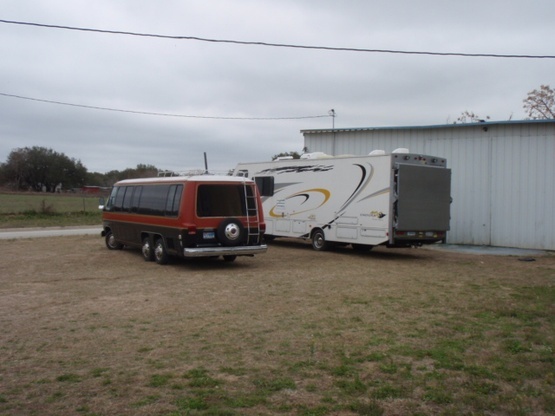 The GMC is a 1978 but fully restored, modern and heavily customized into a Toyhauler Floorplan. It has a turbocharged GMC 8100 engine, all electric (20kw battery pack made from 1/3 of Tesla automobile battery pack, 1200 w solar) with compost toilet and recirculating filtered grey water system, my wife takes 15 minute showers washing hair and all using 1 pint of water lost to the evaporation and the towel. About the same amount of water for a load of laundry. 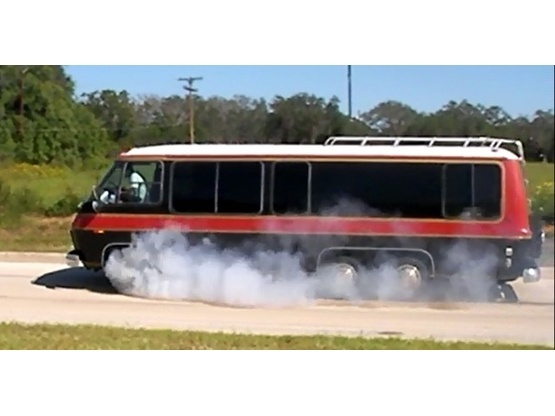 The Class C is a Gulfstream EnduraMax Toyhauler, modified with composing toilet and grey water filtered recycling system. Recently the three of us did a 27 day off the grid boondock and used only 35 gallons of the onboard water. This was filtering and reused about 40 times or (1700 gallon equivalent) for shower, laundry and washing up. During the 27 days we also consumed 53 gallons of drinking/cooking water from separate tank. The compost toilet was dumped at day 20 and again upon arriving back home, just to store it. We can carry 230 gallons of water but our inflatable Jacuzzi holds 135 gallons so we need that much. It's great to never hookup to electric, and to have no Black Water system, we only dump our grey water for storing the rigs. We will use the 26' GMC most of the time, after it's current refurbishment. Fuller's "Fun on the Flatlands"
Very talented interesting host. He helped us with what to see in the area. Location is very good. Thank you. Would definitely stay again. Gerald was so kind to allow us to start our stay early. Very kind host. Excellent 1st day. Looking forward to staying 3 more days. Really talented host. Love hearing stories about his ventures. Our host was so very interesting with a wealth of information and stories. Located in a quiet area close to all the necessities. Our first night was spent with 2 other Boondockers around a fire with food, drinks and good conversation. We enjoyed watching videos and listening to his stories of inventions, of the numerous motocross adventures, bicycles he has built, recreational vehicles / shipping containers he has designed and about his family here and in China. Our stay with was great! He helped us back into our site as well as two other rv’s. He was very kind and hospitality was amazing. Brought out a gas fire ring where all guests and host spent several hours visiting. Felt very safe. Hope to be back! Thank you for a great stay!!! Even though we cut our visit short (we decided to explore further out) our stay was a good one. Host is very knowledgeable on pretty much everything! Thank you for the stay and good luck on that motorhome rebuild. We truly enjoyed our stay in Pleasanton. Our host was an amazing guy and was a wealth of information and interesting stories. Nice quiet area to stay with plenty of place to walk our dogs in the neighborhood or at a nearby park. As a bonus, if you need any work done on your rig you can have it done there. We left as friends and look forward to stopping by again the next time we’re around San Antonio. Great exchange of ideas and appreciate getting his old roof vent cover. My husband and I had a great and easy going stay at Gerald’s! We enjoyed chatting with him and hearing about the area and his stories. Host is a weath of information! We enjoyed our short stay at Fun on the Flatlands! The host is super friendly and knows about a wide variety of things. He helped me jack up the trailer when it tried to roll and fell off the front block. He also told me about some wonderful products that are out there for nomadic travelers. If you stay here, be sure to ask questions! Knowledge is always good! Very pleasant stay extended another night for weather reasons. Enjoyed visiting with the host great stories. We would stay again if in the area. Thank you Boondockers Welcome.com. Our host was very welcoming and we had a good night's sleep. A little surprising since we were close to a highway. Maybe will stay longer than one night another time. Went to San Antonio one day. Lots of conversations. ...another super stay with this host. Unfortunately, circumstances prevailed otherwise and it will have to happen down the road. Thanks, Acme71, for the opportunity to make use of a great layover spot. Very safe and comfortable stop. Host was out of town but still kept in contact to make sure we were all hooked up and everything. Hope to stop by again when he is there to meet him! We had a nice stay and enjoyed talking with Gerald. He was a great host and has a nice location for visiting San Antonio. The location was great for checking out San Antonio area. Quiet and safe feel with easy access from the interstate. 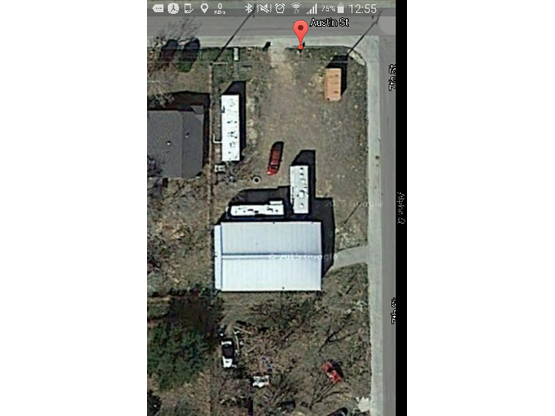 Almost level site on grass/dirt lot. In a neighborhood and mixed industrial area. Other close by parts of town offer shopping, restraunts, laundrymatt, car wash and others travelers needs. 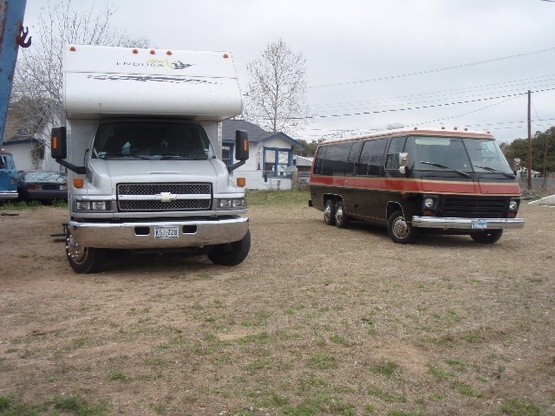 Host helpful and interesting stories about travels and experiences with RV life. Nice 2 nite stop for us, longer stays accommodated also. We enjoyed the stay. Gerald is a very interesting individual. Although he is a very generous and gracious host, his most insightful quality is his engineering genius. We enjoyed listening for a couple of hours to his descriptions of inventions he has created and sold, of his numerous motocross championships he has won, and the bicycles he has built for racing and for recreation. 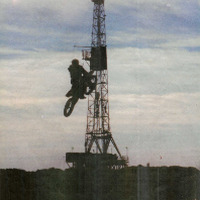 He is a mechanical engineering marvel and you will certainly enjoy learning about his exploits. Host is a world traveler, speaks more than 2 languages (one Chinese), inventor and true jack of all trades, including holder of the world speed record for an RV (I kid you not! lol). 30 minutes south of Austin. We appreciated our time staying here. He was very helpful in suggestions for a repair on our trailer and completed it for us. His knowledge of world affairs is amazing as he has travelled the world. A wonderful host. The host was very kind and welcoming. We shared ideas, conversation, and he was extremely helpful. His property is safe and easily accessible from the highway. He kindly offered electric, water, and he even has a place for dumping. We would gladly stay here again. Easy to find, quiet, and very safe. Thanks to the host for an easy stay!!! ...to tuck your head down for a night or two with water and electric available and a quiet neighborhood. Although our host was on the road elsewhere, we did converse via email and he made us perfectly welcome. We were greeted by the two little boys from next door who were obviously the security guards and friends of our host. We would stay again. Friendly and Excellent host. A nice quiet spot that we were able to enjoy for a couple of evenings. He even helped me check out the front end of my truck as I was concerned about some unusual heat and smell coming from the front tires. If I find myself in the area again, I will make sure to reach out again to stay here and to see how his GMC motorhome "build" is going. Friendly, welcoming and helpful. Easy in and out. Quiet. We stayed in 40' fifthwheel. I didn’t get a chance to meet my host, but was allowed to use site and facilities. All went very well! Thanks! Great, quiet place to spend the night after a long day of driving. Our host even welded the cracks on our tow dolly.